By Alisa PriddleGeneral Motors said Sunday it stands by its Super Bowl ad that plays on the Mayan calendar's predicted 2012 end of the world in which survival depends on driving a Chevrolet Silverado. The ad can be seen by clicking here if you are on a mobile device or tablet. It ran during the first quarter of the Super Bowl, one of five Chevy spots. On Saturday, Ford lawyer Lynne Matuszak sent GM a letter demanding that the ad not air and be removed from all websites and social media outlets. Ford objects to the commercial showing the owner of a Ford F-150 pickup as one who did not make it to the meeting point safely. GM, in a statement, pointed out the ad is an over-the-top spoof with "the devastation and destruction predicted to occur this year by the Mayan calendar (including) giant attack robots, meteors and frogs falling from the sky." "We stand by our claims in the commercial, that the Silverado is the most dependable, longest-lasting full-size pickup on the road. The ad is a fun way of putting this claim in the context of the apocalypse," said GM Global Chief Marketing Officer Joel Ewanick. Comment: This commercial doesn't have any Native content except the headline linking the disasters to the Maya. 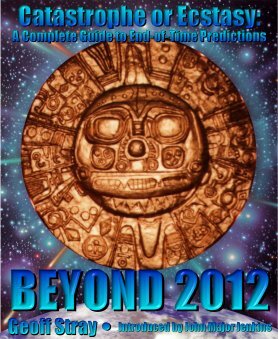 It also doesn't explain what the "2012 Mayan Apocalypse" is. As Newspaper Rock readers know, the Maya say the year 2012 doesn't signify anything. If it did signify something, it would be transformation, not destruction. But so far the media isn't making this crucial distinction. Starting with the 2012 movie, it's all about the end of the world. Viewers may wonder if the Maya are somehow causing the disasters rather than merely predicting them. You know those demonic Indians with their supernatural abilities. They're always returning from the dead, fulfilling curses, and harming those who wronged them. Nor is this the only TV commercial along these lines. Rather, it's probably one of many we'll see this year. Indeed, I just saw another one--for health insurance, I think. It showed cutouts of people flying off the screen. The message was something like: "The Mayan calendar says you're doomed. Buy our insurance and show the Mayan calendar who's boss." Again, there's a whiff of a negative message. Namely, that the Maya--those barbaric, human-sacrificing savages--are attacking us via their calendar. Their ancient magic is reaching across time and space to destroy our world. The implicit hasn't become explicit yet. But I wouldn't be surprised if it does. Look for movies, TV shows, and commercials with "evil" Maya priests threatening to wreak havoc on modern civilization. Will any movies, TV shows, or commercials show us modern Maya Indians? Who are predicting a peaceful transition to a more enlightened age? Don't count on it. That kind of message goes against our prevailing stereotypes: that Indians exist to kill and destroy, not to create and build. For more on the subject, see Maya Excluded from "2012" Tourism and Maya Calendar in Saturday Night Live.